Governing the Think Factory provides readers with an in-depth look at organizational compliance requirements within three major areas: corporate governance, operational compliance, and global migration/workforce compliance. It then shows how to manage compliance, with a look toward global future trends that will impact the compliance framework, helping businesses establish goals and improvement benchmarks going forward. 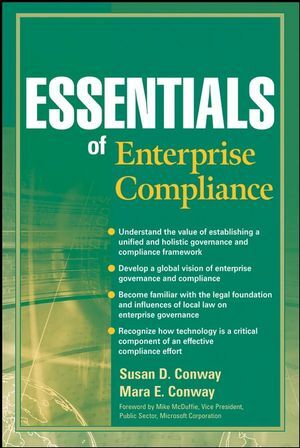 Susan D. Conway is one of Microsoft's passionate advocates of productivity improvement, currently working with public agencies, including the U.S. Air Force, Federal Reserve, and Maricopa County, Arizona, and with commercial enterprises, including Nationwide Insurance, Carlson Hotels, and Korean Air, on business intelligence and productivity. She is the author of The Think Factory (Wiley) and coauthor of Unlocking Knowledge Assets. Mara E. Conway is an attorney focused on international law, immigration, and employment law. She has practiced in Washington, California, New York, and Japan (as a U.S. expert within a Japanese law firm). She has practiced both federal and state law and advised a wide variety of enterprises on compliance and employment related issues. Chapter 1 Compliance: Law and Society. Chapter 3 A Framework for Governance. Chapter 4 Exploring the Potential. Chapter 5 Compliance at the Desktop. Appendix A Sarbanes-Oxley Act of 2002—Effective Compliance and Ethics Program. Appendix B Description of the Technology Features Relevant to Compliance.